The great wide open spaces of Africa are opening up to us, coming into our homes from across our devices, all neatly packaged inside a 3x5 online game slots machine. 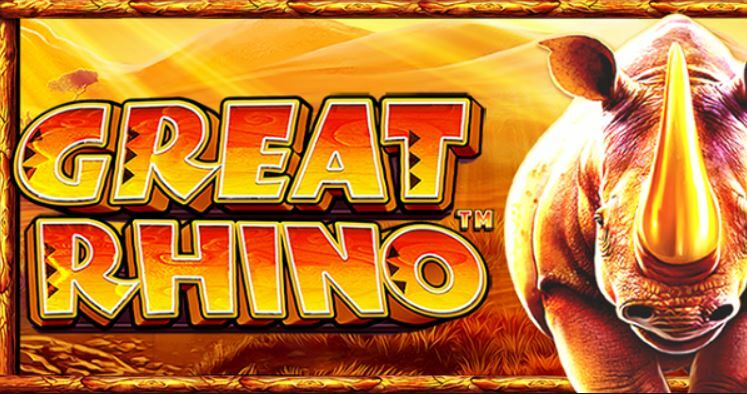 Great Rhino is a stunning way to ‘see the sights’ without having to pay for the flights, and you’ll be much safer when playing from home. Sporting a colourful interface, coated in rich reds and burnt oranges, Pragmatic Play have done a fine job of adding texture to this game. The graphics may not be the most polished we’ve seen, but the 5 reels and 20 winlines are more than attractive enough for such a modern title. What makes Pragmatic Play stand out most from its competitors, is that the company doesn’t simply bombard us with amazing graphics and then no substance. Instead, they try to balance the two out, a fine dynamic that has ensured their continued growth since their founding in 2015. Based in Malta, they’re at the heart of the iGaming scene, therefore allowing them to create a series of games well suited to the diversity of the market. This shines through in the way they develop their bonus features, which often function across a multiple screen platform; such is their expertise that they’re now one of the fastest growing brands of our time. Join & Play, and find some incredible games by Pragmatic Play! One of the key features of this title is that it can be cheap and cheerful, should you wish to save your pennies; simply decide how many coins you want played on each line, as well as their value, and you can begin. That simple act gets you access to the standard paytable, but also two bonus features: the respins and free spins. 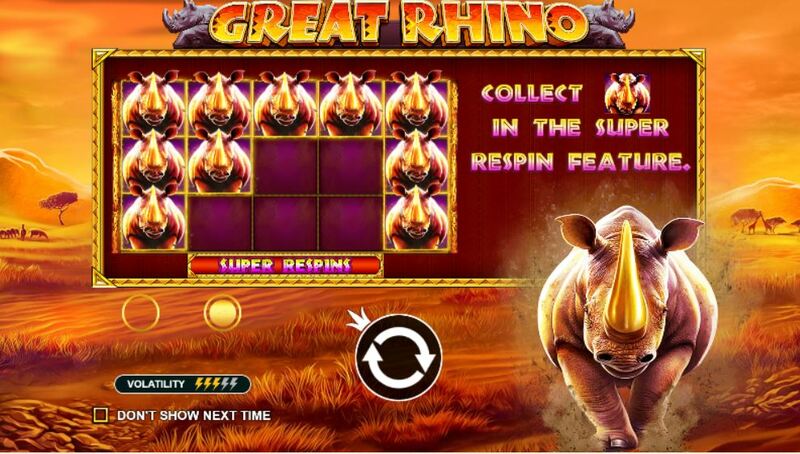 Although this wonderous rhino and his friends aren’t going to shower you with wads of cash, the returns can be quite high, provided you wager more money. The higher your stakes, the more the paytable increases its value; this is one for the highrollers, who not only want to see animals in their natural habitat, but want to hunt out great wins as well. * Super Respins: The rhino symbol is the key to this feature, with you needing to get two stacks of them to enter into the round. Although not an easy feat, once that’s achieved you’ll get three respins, with the chance to unlock the Major Jackpot at the end of this mini game. * Free Spins: Only available on reels two, three and four, this bonus is a little tricky to get but worth it once you nail it. 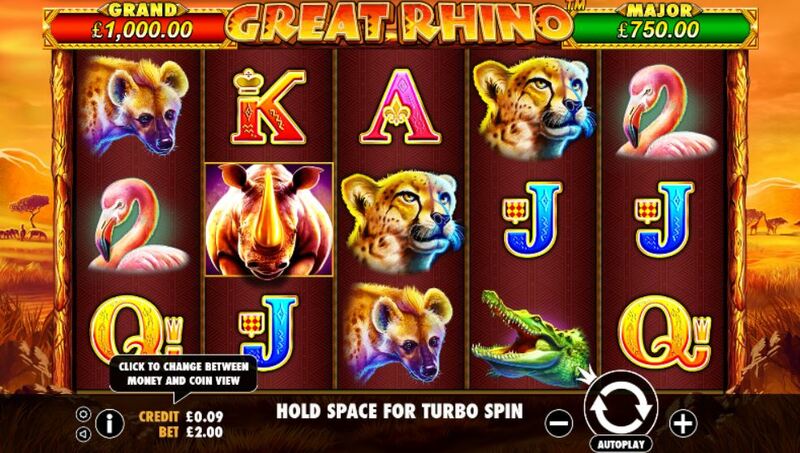 Get three of the bonus icon to activate 10 bonus spins, with the rhino becoming a wild during this time.